rv-pro.com September 2018 • RV PRO • 131 "That's something that's starting to trend and has been for the last couple years: The idea of a front windshield is to get more daylight in," he adds. Brian Edwards, general manager for one of LCI's Goshen, Ind.-based plants that manu- facture windows for the RV market, says right along with that goes durability. "Plastics have been tried, but they're not quite as durable," Edwards says. "The acrylic scratches easier, it can fog up, and it suffers wear-and-tear over time from dust and dirt. Glass is just a lot more durable as a product." 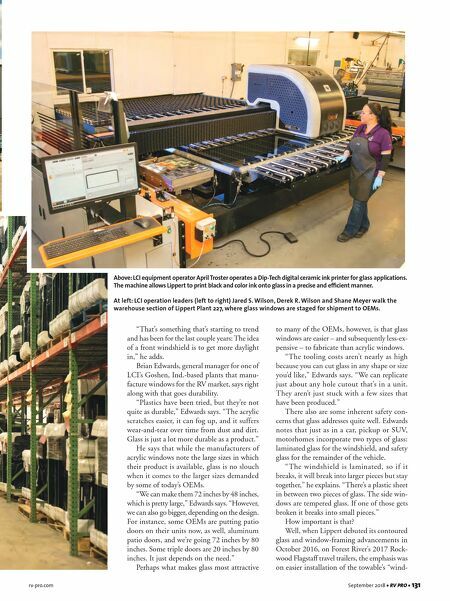 He says that while the manufacturers of acrylic windows note the large sizes in which their product is available, glass is no slouch when it comes to the larger sizes demanded by some of today's OEMs. "We can make them 72 inches by 48 inches, which is pretty large," Edwards says. "However, we can also go bigger, depending on the design. For instance, some OEMs are putting patio doors on their units now, as well, aluminum patio doors, and we're going 72 inches by 80 inches. Some triple doors are 20 inches by 80 inches. It just depends on the need." Perhaps what makes glass most attractive to many of the OEMs, however, is that glass windows are easier – and subsequently less-ex- pensive – to fabricate than acrylic windows. "The tooling costs aren't nearly as high because you can cut glass in any shape or size you'd like," Edwards says. "We can replicate just about any hole cutout that's in a unit. They aren't just stuck with a few sizes that have been produced." There also are some inherent safety con- cerns that glass addresses quite well. Edwards notes that just as in a car, pickup or SUV, motorhomes incorporate two types of glass: laminated glass for the windshield, and safety glass for the remainder of the vehicle. "The windshield is laminated, so if it breaks, it will break into larger pieces but stay together," he explains. "There's a plastic sheet in between two pieces of glass. The side win- dows are tempered glass. If one of those gets broken it breaks into small pieces." How important is that? Well, when Lippert debuted its contoured glass and window-framing advancements in October 2016, on Forest River's 2017 Rock- wood Flagstaff travel trailers, the emphasis was on easier installation of the towable's "wind- Above: LCI equipment operator April Troster operates a Dip-Tech digital ceramic ink printer for glass applications. 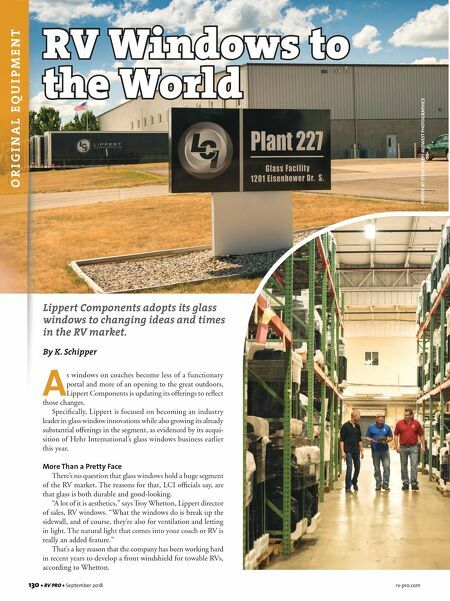 The machine allows Lippert to print black and color ink onto glass in a precise and efficient manner. At left: LCI operation leaders (left to right) Jared S. Wilson, Derek R. Wilson and Shane Meyer walk the warehouse section of Lippert Plant 227, where glass windows are staged for shipment to OEMs.